Notes: Main armament removed and controls moved inside tank. Notes Main armament removed and controls moved inside tank. Notes: The Matilda Scorpion was a Matilda Infantry tank fitted with a mine clearing frail. The frail was designed by a South African officer called Maj. A. S. Du Toit which beat a path through mine fields by revolving chains. The device was manned by a crew member positioned in an armoured box attached to the side of the hull of the tank. Later variants moved this device into the turret compartment by removing the main gun. 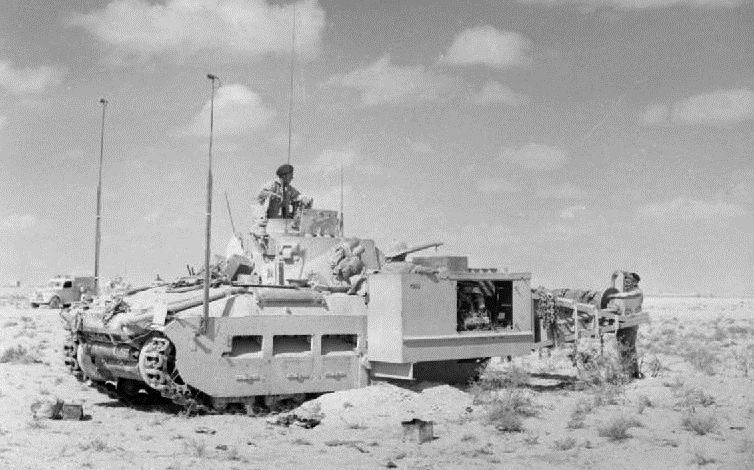 The first Matilda frails saw action at the second Battle of El Alamein in 1942 and went on to serve in the rest of the North African campaign. The Matilda Scorpion was withdrawn from duty in 1943.